There's no better way to see the island than from a high-speed watercraft on the Gulf of Mexico and the Atlantic Ocean. With two locations in Key West, head to Barefoot Billy's for all of your watersport needs. As the leader in tours and recreational equipment rentals for over 20 years, Barefoot Billy's provides visitors with the most exciting adventures, both on and in the water. While famous for their Island Jet Ski Tour, they offer four other tours and cruises for seeing the island. From sunset cruises to snorkeling and dolphin watching, soak up the sun and enjoy all there is to do on the water with Billy's. Make your reservation online or in person at their two locations in Key West, one just steps from Southwinds Motel. Prices vary per tour or rental. Open daily from 9 am to 8 pm. Where is the best place to book a snorkel trip in the Florida Keys? Whether it’s your first time snorkeling or your 50th, let Barefoot Billy’s take you on the ultimate Key West adventure below the ocean. The Dolphin Watch and Snorkel Cruise is perfect for those looking to enjoy the day on the Gulf of Mexico looking for dolphins and swimming with schools of fish in their natural habitat. Enjoy the catamaran ride while learning all about the diverse ecosystems in the Florida Keys, and then embark on a snorkel adventure with starfish, rays, turtles, conch, corals, sponges, and tropical fish. All equipment is provided along with expert instruction. 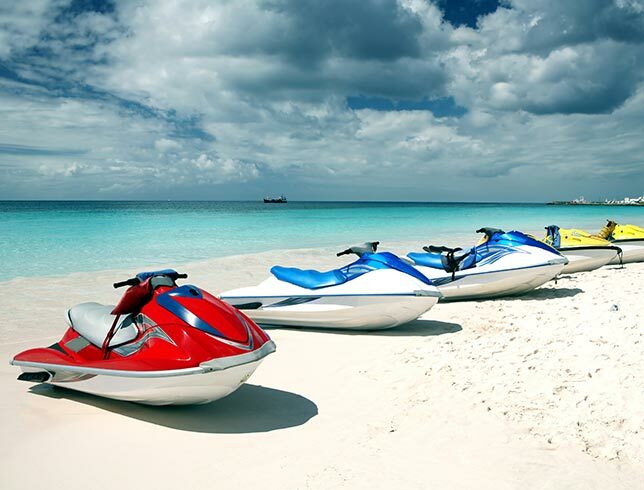 Where can I get a Key West Jet Ski Island Tour? Set out on a fun watersport excursion with Barefoot Billy’s. The Island Jet Ski Tour is available several times throughout the day at both Key West locations at the Casa Marina Resort and at Reach Resort. The Jet Ski Island Tour is a 2-hour run through the Caribbean waters on one of Barefoot Billy’s Yamaha Waverunners. Reservations can be made in advance online, or in person at either location.